Beautiful choice of spectacle ranges available, varying from budget friendly to limited editions. If you are looking for something a little different, you are sure to find something to suit your taste in this boutique store. We are a friendly family run business and are happy to welcome you in-store simply to browse or if you have any queries we would be happy to help. We use Australian made lenses, which are created with top of the line materials to make sure you have the best vision possible. Whether you have worn glasses for as long as you can remember or you’re a first-time wearer, we always endeavour to make the experience a positive one for all of our clients. We stock collections that we feel are great quality and are made in a way that means we can fit your spectacles the right way for you. The ranges have a multitude of different and unique things to each of them. Traversing from the bright fun-loving colours of the rainbow, to opaque rich tones to the subtle transparency of crystals into marbled mixtures of earthy hues. There is an abundance to choose from. Every spectacle owner is different. Whether your glasses last you ten years or perhaps it’s an achievement if they last the year out, we can cater to your life and what you need your glasses to achieve for you. Life can be very rough-and-tumble…lovable grandchildren who think your glasses are the newest plaything or the families new puppy who is enjoying your glasses arm as its new chew toy, we know life is hectic. Let us help you find the frame that will withstand your lifestyle. Think of your spectacles as a piece of art…Many have been crafted to sit fluidly against the face, perfectly framing the shape of your inimitable eyes…your eyes are your own, just like your fingerprints. Enjoy the knowledge that you can frame them with beauty. 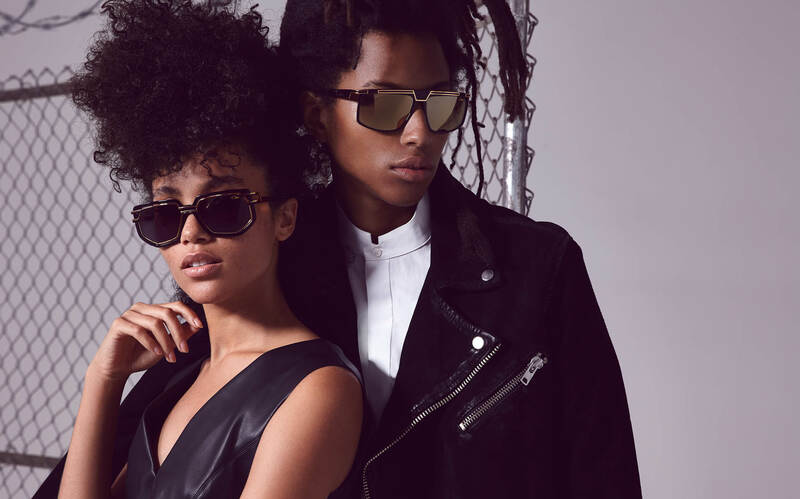 The ‘Decades’ range has been reinvigorated by Oliver Goldsmith. 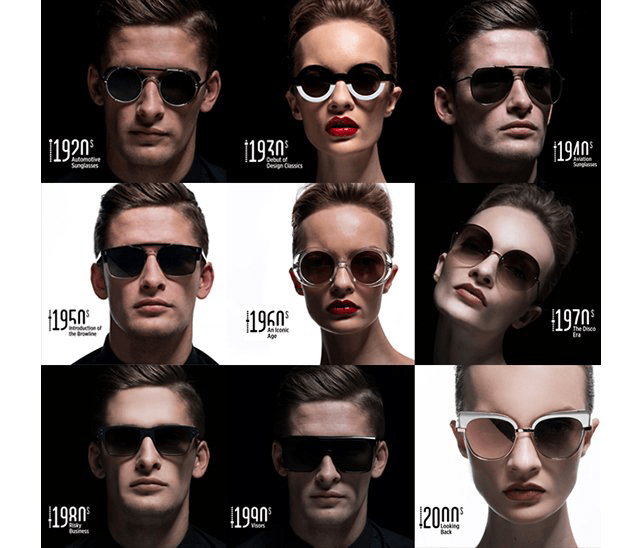 The creative element behind this has been to recreate the most iconic sunglasses for each decade for the past 90 years. While the overall shapes and distinctive styles will be well known by many people, and the famous faces who wore them throughout the ages, these eye pieces are courageous in design and well known as icons. Each style is a meticulously researched representation of something monumental that was taking place in eyewear fashion and lifestyles at that time. Round lenses were introduced in the early 1900s and maintained popularity throughout the 20s and 30s. Metal wire driving glasses with pre-tinted lenses that also encompassed leather side cups became hugely popular and really coined the look of 1920s eyewear. The 1930s brought us coloured lenses that could absorb both ultraviolet and infrared light. Fashion was highly influenced by stars of the silver screen. Greta Garbo popularized the windblown look, with her side-parted hair. Vogue 1939 is also one of the most visually iconic covers, showcasing 1930 eyewear fashion perfectly. The 1940s saw Bausch & Lomb launch the original aviators. This is the style from which all future aviator sunglasses originate along with the even more famous “General” brow bar designed to improve the balance of the sunglasses on the face. The “teardrop” shape lens was designed to accomodate pilots who were constantly looking down at their instruments while in flight, and all aviators are recognized by this lens shape. By the 1950s spectacles were considered part of a persons wardrobe. Similar to clothes, eyeglasses needed to be continually updated. The biggest trend was the ‘browline’ combining both metal and plastic. The browline was so popular after the second World War that it made up 50 percent of all eyeglass sales moving right into the 1950s. The 60s were dominated by strong black and white shapes and a newfound sense of futurism. High fashion became synonymous with oversized bug-eye glasses. Jackie O was a huge fan of the bug-eye look, as was Audrey Hepburn, both frequently photographed wearing these supersized black frames. Their popularity and influential styles had a major effect on women at that time and helped to solidify this look as chic and very 1960s. For any unwanted or unneeded glasses, we collect them on behalf of the Lions Club, who then donates them to the less fortunate. Let us recycle your unwanted glasses for use in less privileged countries. Your donation will be a Gift of Sight! Any spectacles taken. Drop off in store.